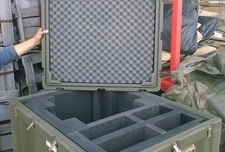 Fortified ZERO transit cases 41"x33"x24"H, w/reinforced bottom, in perfect condition. Butterfly latches, rubber seal, HD metal carry handles. Some surface scratches may occur. Caution: Large item !! Choose FREIGHT option from the shipping calculator when adding to your cart. You may also pickup yourself. You may ship up to 4 cases for the price of shipping 1.